The Criterion Theatre is a cinema, performance theatre, and venue located on Cottage Street in Bar Harbor, Maine. It opened in June 1932 featuring vaudeville performances and movies during a time when Bar Harbor's summer scene was at its height. Today it is one of only two Art Deco theaters in the state of Maine and is listed on the National Register of Historic Places. The 760 seat theatre was built for a convicted bootlegger named George McKay. After his release from federal prison, McKay solicited bids for constructions of a glamorous movie palace. 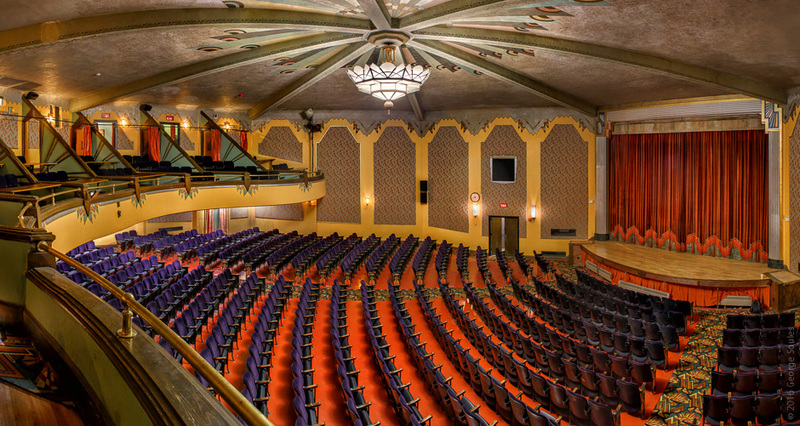 The high bid of $95,206 was beat by Bunker & Savage Architects of Augusta, Maine who built the theatre in just six months for a contract price of $58,000. That's about $900,000 in today's dollars, a surprisingly low figure for such a magnificent structure. A $2 million dollar contribution from an anonymous donor in 2014 made possible the purchase and restoration of the Criterion which now operates as a 501(c)(3) nonprofit organization committed to safeguarding this historic space for stories, storytellers, and audiences. 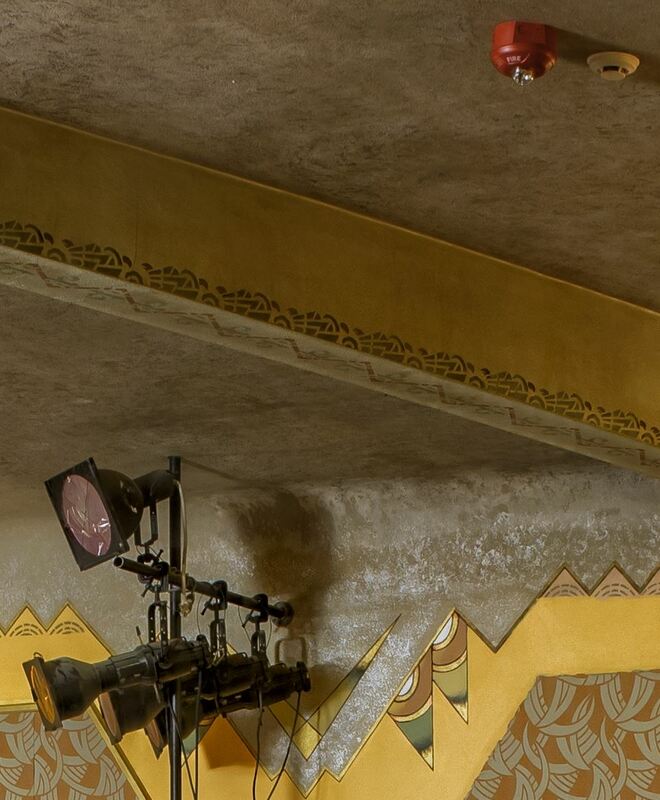 Today, almost everything in the building is original or as close as possible to it, including the light fixtures, curtains, seats, and stencils on the ceiling. Criterion director, Heather Martin graciously opened the theatre to the MDI Photo Club for our February photography outing when I made the images below. I photographed the Criterion from the balcony with a Canon 5D Mark III DSLR and a Canon 24mm tilt/shift lens using available light, which there was little of. To the naked eye, the space does not look nearly this bright. The first photo is a four-slice panorama with a 140° field of view. The second is five slices covering 190°. Each picture is a composite of 18 different images shot at f/8, ISO 400, with exposures ranging from 10 seconds (for the main room) to 1/25th second (for the chandelier). To minimize noise, I used the camera's long exposure noise reduction feature and a relatively low ISO. I mounted the camera vertically on a Nodal Ninja panorama head which was in turn mounted on a Really Right Stuff panning clamp and tripod. This set up allows the lens to pan over its nodal point and thus avoid Parallax that would have made it impossible to stitch the balcony rails in the foreground. A fancy rig like this is not necessary when shooting landscape panoramas, in fact you can shoot them freehand, but for a scene like this it was essential. I stitched the images together using PTGui and did manual exposure blending in Photoshop. In theory, you could get these same shots in a single frame using an ultra wide-angle lens; however, the resulting image would not have anywhere near the resolution of these. The full-size version of the second image below is 11,778 pixels wide by 5,860 pixels tall. To get the equivalent resolution from a single frame would require a 69 megapixel camera (the 5D Mark III is 22 megapixels). To get a sense of how big the image is, click here to see a 100% crop of the upper right corner. Notice how much detail and how little noise the image has. If you've never experienced the Criterion, it's a must-see during your next visit to Bar Harbor or Acadia National Park. I remember how amazed I was the first time I entered the theatre in 1977 to see the original Star Wars. I was just as amazed this past Halloween when I attended a live midnight stage performance of the Rocky Horror Show. Thanks to the wonderful people who now run and care for the Criterion, all of us can look forward to enjoying many movies, performances, and community events in this very special place.